This weekend I embarked upon the Sweetly Raw Dessert Challenge to try a mouth watering Parfait from Heather Paces’ new ebook Raw Party Parfait. This ebook is fantastic, perfect suggestions for all seasons with summer fruit parfaits or winter chocolate parfaits! All the recipes are gorgeous looking, simple to prepare and only require a blender. If you have not already purchased this ebook, then you may miss out on these spectacular gourmet desserts! I also recommend her Just Desserts ebook as it is full of cakes, cookies, puddings and so much more! I have made several desserts from this ebook and have never been disappointed! Heather Pace is an inspiring Raw Dessert Queen! In her Raw Party Parfait ebook each parfait is more delicious sounding than the last and I had difficulty picking which one to make first. But in the end I mixed 2 parfait layers, the Blueberry Jelly with the Dark Chocolate Mousse to make this delicious Blueberry Dark Chocolate Parfait. As these are not my recipes, you will need to purchase the ebook to get the full recipes. For the Blueberry Jelly I halved the recipe and substituted the chia seeds with flax meal as chai seeds are not locally available. I made this layer first so that the flax meal had at least 5 minutes to allow the blueberries to thicken. Surprisingly, I achieved a perfect jelly consistency using flax meal and I think I might even use this recipe for my PBJ raw sandwiches! The Dark Chocolate Mousse turned out delicious! I used the full recipe as I wanted a full chocolate experience and left out the vanilla powder and dates and added 2 bananas instead. In my experience with my Chocolate Banana Cream filling in my Chocolate Dream Pie, the bananas along with the avocado, added the sweetness and even more frothy consistency. As an added decoration I made Dark Chocolate Mousse ‘Cookies.’ This was really simple, I wrapped a small cutting board in plastic wrap and plopped 4 small Dark Chocolate Mousse small cookie size circles on the surface. I froze this for a minimum of 20 minutes and only peeled them off the cutting board right before I served the Parfaits. To assemble the Parfait, I used 4 tall glasses that had a volume of 1 1/4 c and spooned in a large layer, about 3-4 tbls of Dark Chocolate Mousse in the bottom of each. I wanted an extra chocolate punch so I made the Blueberry Jelly half the height of the chocolate layers, about 1 1/2-2 tbls. 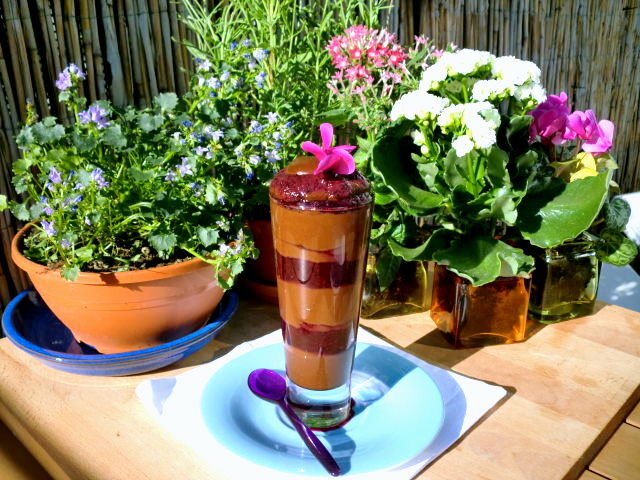 I continued this layering process for about 3 layers of each and topped the Parfaits with a frozen Dark Chocolate Mousse ‘Cookie’ and an edible fuchsia colored flower, a perfect Heather Pace touch! I enjoyed these in my favorite summer spot, the garden balcony, gazing out onto the European church steeples of Hamburg and listening the birds fly by on a quiet Sunday summers evening. They were so beautiful we couldn’t resist eating dessert before dinner! The other 2 Blueberry Dark Chocolate Parfaits are for tomorrow night. Thank you Heather for giving me something to look forward to on a Monday! This entry was posted on July 25, 2010 by Olive. It was filed under Uncategorized . Wow, this looks beautiful and amazing! Good luck!